Make brownie mix as directed on the box or using your favorite recipe. Add 1/4 tsp. of mint extract. Spoon into the bottom of a greased 9x13 baking pan. Make chocolate chip cookie dough (HERE is my favorite recipe) and drop by spoonfuls on top of the brownie batter. 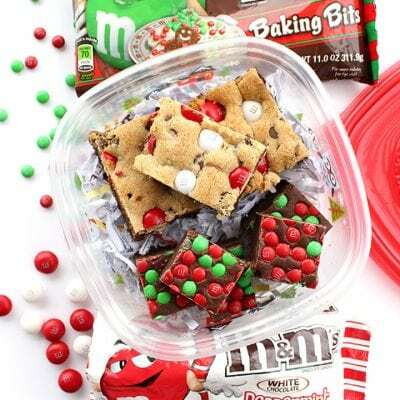 Top with M&M's White Chocolate Peppermint Candies. Bake for 25-30 minutes until the tops of the cookies are golden brown, and a toothpick inserted into the center comes out clean.